FIGURE 10-13 Speculative scheme of the induction of apoptosis in susceptible T or B cells by glucocorticoids that includes a key role for an ICE / ced3-like protease (mch). There is as yet no direct evidence that an ICE / ccd3-like protein is on the glucocorticoid pathway. If not, it means that there may be more than one principal path to apoptotic cell death. Glucocorticoid enters the cell and binds to the cyctoplasmic unoccupied receptor. The receptor complex is activated in the cytoplasm by disaggregation of the oligomeric non-DNA-binding form, releasing the monomeric active receptor. 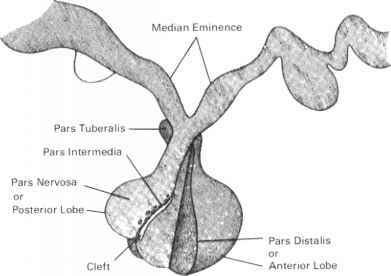 The receptor dimerizes and is translocated to the nucleus through the nucleopore. Once inside the nucleus, it is presumed to bind to a hormone-responsive element upstream of a gene encoding a specific ICE/ced-like enzyme (mch). There is no evidence for this point. This would result in the transcription of mRNA for mch or some regulatory factor, levating its active concentration in the cytoplasm after translation. This mch in a proprotein form would be cleaved to p20 and plO subunits, which could combine into a p20-pl0 dimer and become active. It is possible that the dimer could dimerize into a tetramer (p20)2-(pl0)2. There is no direct evidence of what enzyme splits out p20 and plO subunits from the proenzyme form. It could be accomplished by the mch itself if there were a small amount of the active form available, or there may be another Asp-X protease that accomplishes the activation. Once activated the mch could bind and cleave a substrate, which could be a specific pronuclease (no data on this point), as well as other important proteins in the cell. The nuclease would be activated by this protease cleavage, and it could translocate to the nucleus (again no data here) and attack genomic DNA, generating fragments of 50-300 base pairs. The larger pieces might serve as substrates for another nuclease to generate internucleosome-sized DNA (180-200 base pairs). Nuclear condensation would occur and apoptotic bodies would form, followed by cell death. The dead apoptotic cell would be quickly recognized by macrophages and removed so that an inflammatory process would not be generated. plex is the non-DNA-binding oligomer of the glucocorticoid receptor, in which the receptor is complexed with other proteins in a manner in which the zinc finger DNA-binding region of the receptor is occluded, presumably by hsp 90 dimer. In this form, when the receptor is associated with these other proteins, it is in a conformation favorable for productive binding by hormone, as compared to the activated or free monomeric form. When steroidal ligand enters the cell, presumably by free diffusion, it binds to the unoccupied receptor with high affinity (Kd = nM). This complex can then be activated or transformed (cytoplasmic activation) by dissociation of the oligomeric complex to yield the free receptor subunit in the DNA-binding form. This activated receptor forms a homodimer and is translocated to the nucleus through the nucleopore with the participation of the nucleoporins (see Chapter 1), possibly involving hsp 70. Inside the nucleus the receptor can "search" DNA for the hormone-responsive element, to which it binds with high affinity. Binding to the major groove by the upstream zinc fingers strengthens the homodimer interaction that involves the downstream Zn2+ fingers and other sites on the molecule, in the steroid-binding domain, as well. Other transactivating proteins bind to the pretranscrip-tional complex until the complex can support the binding and function of RNA polymerase II (see the following discussion on transcription). RNA polymerase II initiates the transcriptional process, which results in the generation of mRNA encoded by the hormone-sensitive gene. This mRNA is transported to the cytoplasm for translation into protein. Genes activated in this manner generate proteins in the cell whose actions culminate in the cellular response to the hormone. Not all receptor-DNA interactions lead to gene activation, and some can result in suppression. In this case, the negative hormone-responsive element is slightly altered in the DNA sequence, and suppression may take the form of the receptor interacting with the negative responsive element and competing with a required transcription factor (for activation) whose responsive site on DNA overlaps the negative hormone-responsive element. Other explanations are also possible, and less is known about negative regulation than about positive regulation.